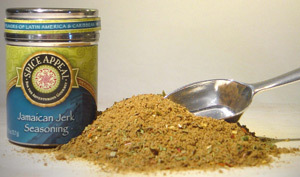 This fiery island blend can be used as a rub or marinade on almost any type of grilled meat. Most commonly used to season pork and chicken, and referred to as “jerk pork” and “jerk chicken.” Makes a wonderful barbecue sauce. Add a dash to a variety of chicken dishes. Includes allspice, garlic, black pepper, chiles, onion, and a variety of other spices.